Plays piano, reads a lot, writes songs with narrative structure and likes lots of the new Aussie music: that’s Tim Freedman of the Whitlams. The single was No aphrodisiac and the band The Whitlams. The year was 1997 and Seattle grunge was the in thing, remembers front man and lyricist Tim Freedman. Not many people were into narrative development in song. No Aphrodisiac stood out like the proverbial. The song also was surprising within itself, thinks Tim, starting as it does with slurp of sentimentality and ending in a jokey fashion. Fast forward ten years and Tim doesn’t feel so alone in the laudable lyric stakes. He’s more often surprised by music, he says and buys it regularly. The mp3 player has a constant turnover of new and interesting stuff. So who’s caught his ear? Jackie Marshall “very poetic”, Augie March, the Drones, Sarah Blasko. As a judge of the Australian Music prize, Tim has an early intro to what’s up and coming. The AMP is important he feels because it’s judged by musicians and critics who do listen to the entries unlike the Arias where the sheer volume makes it impossible to do so. “Practitioners tend to come up with different choices than the more commercial Arias,” he feels. Tim is a reader. “I read more than I write,” he says. Modern fiction – Martin Amis, John Banville. “I know a lot of writers who don’t read much when they’re writing,” he says. The reason being that they’re afraid of being influenced. “I always pity them.” To Tim’s way of thinking, not to read is to deny enjoyment of the craft. He’s joking. He often does. There’s also the political side to Tim Freedman. “There’s always the connection between those with imagination and those who land on the left of politics because landing on the left of politics is about imagining other people’s hardship.” How active is he politically? “I’m concerned with my polis,” he says. In that he’s prepared advocate, to animate, to persuade, but not to be a card carrier or to run for office. “I think that’s only the bare minimum that a citizen should be concerned with in society,” he says, talking of the willingness to air a point of view. Yet Tim’s not convinced that his efforts will necessarily make a difference. As he points out, the decade in which he’s been afforded an audience and a forum have been the years of a Liberal prime ministership. Lately, he’s been a doing a lot of work for the Mick Young Foundation and in the course of that has had more contact with the band’s namesake. “I was just a little star-stuck groupie when I first met Gough and Margaret.” They are “funny, sharp and a great couple,” he says. Now that that natural, initial awkwardness is over, that connection is “a great joy for me”, says Tim. As for the future of Australian political leadership, Tim’s got Kevin Rudd at $2.20 and has staked the house on it. The Whitlams play at the Nannup Music Festival and then Tim heads off to Berlin. Later in the year, the band will again team up with the symphony orchestras including the WASO on November 9th and 11th. Of that first joint concert in Kings Park, Perth, Tim recalls the experience as better than he had anticipated. The WASO had done all the arrangements and the first time the band heard them was at the first combined rehearsal. He need not have worried. They were “marvellous, imaginative, not based on the records”, he says. 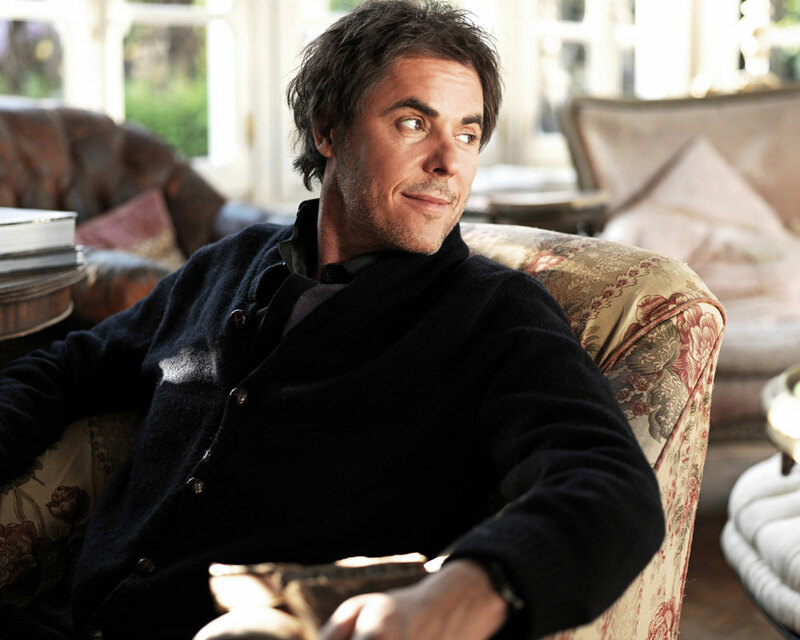 The Whitlams’ Tim Freedman, one of Australia’s most talented songwriters, gets it right on the new album, Little Cloud and the Apple’s Eye. Tim Freedman might be the most misunderstood person in Australian music. Mention The Whitlams’ singer’s name and people are quick to offer an opinion – often, however, it’s about him, not his music. The Whitlams are a group, but it’s Freedman’s songs and personality that commands our attention. Ultimately, you need to go to a Whitlams’ performance to get the picture. Sitting behind his keyboards, chatting with the audience between songs, Freedman is like the guest who takes over the conversation at dinner, for better or worse. It can be intimading the first time, but the more you encounter him the more you like him. Unfortunately many radio programmers find it hard to pigeonhole the Whitlams’ music. It doesn’t come from an obvious genre pool. The huge hit single, No Aphrodisiac, sneaked up on them. Now they’re waiting for another No Aphrodisiac. But there’s more to Freedman’s music than Mr. Lonely Heart. Admittedly The Whitlams’ own records have muddied the waters. The follow-up to 1998 ARIA album of the year, Eternal Nightcap,Love This City was a sterile, studio-locked album. Then, in 2002, came the unfocussed group effort, Torch The Moon. The new album, Little Cloud and the Apple’s Eye, finally gets it right. Again, it’s all about Freedman. There are 16 songs on Little Cloud, divided over two discs. Freedman wanted to separate the ‘Sydney’ songs from the ‘New York’ songs – a distinction made while writing the album. Eighteen months ago Freedman ‘escaped’ to New York and rented a lift. For the silence. For “the electricity in the dreams”. Despite the band’s name, Freedman isn’t trying to change anyone’s political persuasion. On Little Cloud and the Apple’s Eye he’s just expressing his life in song. Three quarters of it is autobiographical. “I never live life just to write a song. Life is so huge. Life is an ocean. To write a song I just put a bucket in the ocean. There are a million other buckets I could pull out. In the end, we are able to recognise Freedman is one of Australia’s most talented performers and songwriters. There are moments on this new album where he’s up there with James Taylor in melody and sentimentality, as innovative as a Ben Folds. He’s a craftsman, heads above James Blunt or Pete Murray. And different. Too different? My favourite Whitlams’ gig was at the St Mary’s Band Club in Sydney in June 2000. The support band Blue Rodeo, from Canada, came onstage during the encore wearing Tim Freedman masks and caused havoc. Ben Fink, The Whitlams’ guitarist at the time, was lifted up on one of the band member’s shoulders and continued playing. The London show in October 2002 was one of my highlights (and I think Tim has said the same about that show). It was just after the Bali bombings, and 2000 Australian’s singing Buy Now Pay Later (Charlie No.2) at the top of their voices – it just made the hair on the back of my neck stand on end. I was waiting for the roof of the Shepherd’s Bush Empire to come off! It was probably then that I realised how far they had come from the band I used to see at the Sando. For those of you unaware of this phenomenon, Myspace is an online network where you can create your own profile, then use it to make Friends and share interests. We are streaming your (new) favourite tracks from the site, so add us to your Friends list and leave us a message. After a rest from his hectic lifestyle, a re-energised Tim Freedman and gang are back. With an ambitious new double CD, Little Cloud/The Apple’s Eye, popular Australian group The Whitlams have returned with their first new material in four years. Exhaustion and an unhealthy lifestyle led songwriter, singer, pianist and all-round main man Tim Freedman to recharge his batteries by leaving the country for a cleansing solo tour in New York. The rest seems to have done him well, for critics and fans are already claiming this is The Whitlams’ most solid release since 1997’s Eternal Nightcap. Importantly the infamously fussy Freedman is happy with this record. The reflective narrative lyrics of Little Cloud make it appear as though the songwriter has enjoyed a thorough catharsis, but the man behind them reveals this isn’t the case. There’s an upside to romantic troubles for artists as the pain can be transformed into grist for the mill if the spirit’s willing. This irony has been known to escape his audience, much to his chagrin. Funnily enough, the comedy throw-away She’s Moving In, the song that sounds the most drawn from life, is a work of total fiction. His choice of Machine Translations’ J Walker as producer has been seen as an enigma in some quarters since his previous work and the grandoise style of The Whitlams seems to be an odd match. “It’s true that this is a reaction to the last two records (1999’s Love This City and 2002’s Torch The Moon) which got a little bombastic in parts,” Freedman says. “I fully admit I went over the line with the amount of instrumentation on occasion – but that’s part of any artist’s growth. Freedman can’t sing Walker’s praise enough. Oddly, the first single, I Was Alive, became the second most added track to radio on its week of release. “It feels oddly like the planets have been aligned in my favour. I won’t curse it by getting too confident,” he says. The song is an example of Freedman turning expectations on their head. Freedman can’t let that go without adding a sly barb. go online and type in the code below to download the songs for free.